Christmas in October? – It's a Britta Bottle! It’s October 22. Halloween hasn’t even come and gone yet. And I have this sudden urge to listen to Christmas music. As I sit here writing this, I have my Spotify turned on to a Mannheim Steamroller playlist, my go to Christmas artist of choice. I’ve always loved Mannheim Steamroller’s Christmas arrangements and I find them to be conducive for studying, which works out perfectly when I’m in the Christmas music mood (a mood that usually only manifests itself between the day after Thanksgiving and December 25). WHAT IS HAPPENING TO ME? I have a strict rule that no Christmas music is allowed until the day after Thanksgiving! 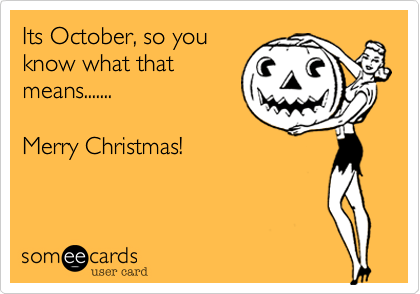 It’s just not right to start Christmas this early and here I am listening to Christmas music on October 22. Whatever can get me through the semester, I guess. Just gotta accept these weird feelings as they come. It’s senior year after all, ay? It’s just been a school year of weird feelings, that’s for sure…at least so far.